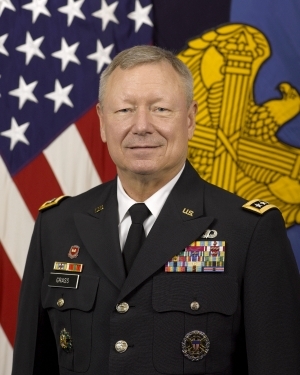 Gen. Frank J. Grass, member of the Joint Chiefs of Staff and chief of the National Guard Bureau, will explore issues facing the National Guard at a National Press Club luncheon Jan. 9. Grass, who took command Sept. 7, 2012, is responsible for ensuring that the more than 460,000 Army and Air National Guard citizen-warriors stand ready to protect the nation and mobilize as active duty soldiers and airmen and women. Since 9-11, National Guard citizen soldiers and airmen have supported more than 760,000 overseas mobilizations, some more than once. The luncheon begins at 12:30 p.m. Remarks begin promptly at 1 p.m., followed by a question-and-answer session. The event ends at 2 p.m.
Tickets, which can be purchased online, cost $22 for Club members and $36 for non-members. Club members may buy two tickets at the member price. Tickets must be paid for at the time of purchase.For questions regarding reservations, please e-mail reservations@press.org or call 202-662-7501. Grass serves as military advisor to President Barack Obama and Secretary of Defense Chuck Hagel and is the official Defense Department liaison to the governors and adjutants general in all 54 states and territories on matters involving the National Guard. Club members who wish to attend the pre-luncheon reception must have a paid reservation to the luncheon and RSVP separately to vipreception@press.org 48 hours before the event. Space may be limited. You must have a paid reservation to the luncheon to attend the VIP reception. To submit a question for the speaker in advance of the luncheon, please e-mail your question to president@press.org with GRASS in the subject line before 10 a.m. Jan. 9.